“Everybody, anybody.” At first an unassuming call and response, the tonality morphs from raucous fun to crickets. 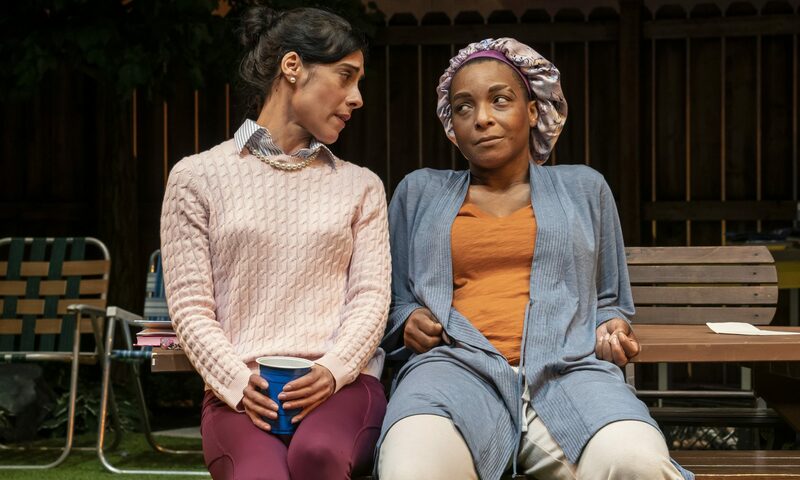 We the audience are both the winners and the losers in Ike Holter’s new play Lottery Day at the Goodman Theatre. Under the exquisite direction of Lili-Anne Brown, the characters come to life and we want to join them. As the final chapter in his 7-play cycle, Holter doesn’t let us off easy—and rightly so when faced with our realities of gentrification, police brutality, political corruption, and trauma. In Rightlynd, the fictional 51st ward of Chicago, we are met with new and old faces alike when matriarch of the neighborhood, Mallory (an unapologetic J. Nicole Brooks), throws a backyard barbecue with a treasure hunt twist. Mallory is our queen, and everybody knows not to press her on the tragedy that struck her household. Her reign has been long, but now she oversees from the last original home among the new concrete kingdom of condos. Nevertheless, we’re delighted to sit back and watch an epic party unfold, equipped with strategic confetti, buckets of meat, limitless liquor, and potential riches. But complications soon follow, particularly from the watchful eye of the neurotic neighbor Vivien, a BBQ-Becky of her own making, (though played by a striking Michele Vazquez). Through masterful scenic design by Arnel Sancianco, we see the new literally juxtaposed against the old, providing a grassy playing space full of metaphors and venom. Vivien lives in a more chic-Barbie Dreamhouse, bedangled with a chandelier, art-decked walls, and oversized windows—ones in which she fails to sneak subtle peaks at the yard below. On stage, it sits opposite Mallory’s residence, where we see a mess of table and chairs transform with blue solo cups and centerpieces. It’s a party white people only dream of being invited to. Nostalgia runs rampant as soulful hits and modern mixes underscore moments of history-sifting and reminiscing. There’s a great partnership here with sound design by Andre Pluess and lights by Jason Lynch. Brown directs with a fierce hand on beats and silence, pointing to her deftness in shifting between dance breaks and busting up the straight-play. On the guest list are a slew of strong femmes—Tori (Aurora Adachi-Winter), a whip-smart theatre-person from Red Rex and friends with their own beef, Zora (Sydney Charles) and new mama Cassandra (McKenzie Chinn). Viv is basically tricked into an invite as Mallory reigns dominant in their tête-à-tête on noise pollution and justifications for calling the police. Rounding out the invitees are the beloved mechanic Robinson (Robert Cornelius, also seen in Rightlynd); handy-man Avery (James Vincent Meredith); lost boy, wannabe rapper Ezekiel (Tommy Rivera-Vega); and Mr-steal-yo-girl-unless-she’s-a gentrifier-Nunley (Tony Santiago). Oh, and Ricky (Pat Whalen, a character from Exit Strategy), who is lucky enough to be among them as the woke white guy with shining moments of broken candidness. This is a play about heads, hands, hearts, and spoons—chosen family, collaboration, surviving post-trauma, and playing smart. Shockingly, most of the truth comes out in a cataclysmic game of “Liar, Liar,” erupting in a roast session with impacts potentially larger than any of them realize. Though winning Mallory’s lottery means a certain type of liberation, there’s little to be done about a neighborhood too far gone. With searing words for the intruding cop academies and the big, bad mayor Rahm himself, there are no minced words, and they come in slam and song. Everybody, anybody and a neighborhood full of hurt—this is a fitting cap on the potential end of an era, though the work definitely continues.